At Aberdeen flowers, the team want to be more than a simple flower shop which is why there are several different other services provided by the florists. First and foremost, in addition to providing you with gorgeous floral arrangements, there are several different gift items on offer. For the new born baby boy, there are items such as fluffy teddy bears on offer. These serve to be lovely comfort toys as well as balloons. 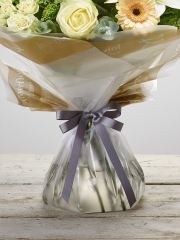 Upon request, the florists in Aberdeen are able to arrange lovely balloon bouquets for you. All the balloons are filled with helium to ensure they stay afloat. A balloon bouquet typically features three solid colour balloons and three with a message fitting for your specific occasion such as, in this case, ‘Congratulations!’. Not only are there gifts for the new arrival, but there are also gifts for the parents. There are both chocolates and truffles on offer, different in taste but both ideal for anyone with a sweet tooth as well as fruit baskets. The fruit baskets are arranged on the day of the delivery with the Aberdeen florists hand picking the fruit to ensure they are fresh and juicy. There is also a range of delectable champagnes and wines on offer which are all rich in taste. Both these beverages are widely considered to be celebratory making them both simply perfect for such an occasion as the safe arrival of a new born baby. These gifts can be ordered to accompany a bouquet or arrangement of flowers or on their own depending on what it is you would like. 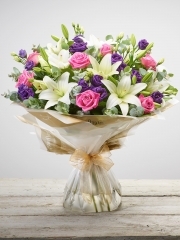 Aberdeen flowers want nothing more other than to provide you with the best possible customer service which is why once your order has been placed you don’t have to worry about a single thing as everything will be taken care of for you. Once your order has been placed, all customers have the choice to use one of the several delivery options Aberdeen flowers has on offer. The team understand that sometimes it’s not always possible to deliver flowers yourself as you might want it to be a surprise or distance can be an obstacle or whatever other reason which is why there are several flower delivery options available. All of these delivery schemes are available six days a week, Monday through to Saturday, between the hours of 9:00AM and 5:30PM. 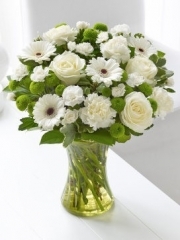 The flower delivery options available are as follows: standard, same day and next day. The standard flower delivery option is ideal for those who like to plan ahead as you are able to place your order several days or even weeks in advance. The next day and same day flower delivery options are perfect for occasions which crop up suddenly out of the blue or for those who are perhaps slightly more forgetful with dates than others. The next day flower delivery option enables you to place your order the day before the delivery date meaning everything is taken care of for you within the space of two days. The premium same day flower delivery option allows you to place your order on the same day of the delivery. Please note that in order to use this delivery option your order must be placed with us before 3PM to give the florists in Aberdeen enough time to arrange your flowers with the care and attention necessary. 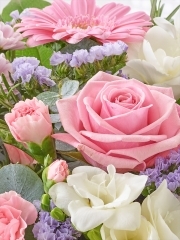 The team at Aberdeen flowers will always do everything possible to ensure you are fully satisfied with the services provided so if you have any further queries or feedback, please do not hesitate to get in touch. 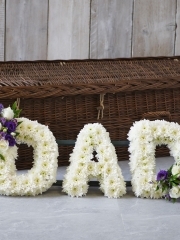 The arrival of a new baby in the world is always a joyous occasion for both the family and friends of the family which is why Aberdeen flowers have a beautiful range of floral designs created with this special occasion in mind. All the flowers the florists work with are of the finest quality as they have been cultivated and imported all the way from Holland. Holland is the western region of the Netherlands which is renowned for cultivating some of the finest flowers in the world and the team at Aberdeen flowers can wholeheartedly agree. Combined with several flower deliveries per week from the Dutch suppliers, the flowers are also incredibly fresh. This means that your recipients will be able to enjoy their flowers for many days yet to come as the quality of the flowers directly impacts the longevity. 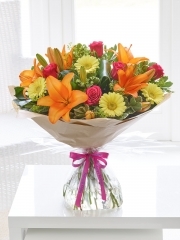 You are able to browse online through the beautiful arrangements the Aberdeen florists are able to create for you. The new born baby girl flowers all come in delicate shades of pinks, whites and yellows however you do not necessarily have to stick to those colour schemes. If you have something else in mind, you are able to use the bespoke service Aberdeen flowers have on offer. Through the bespoke service you are able to either tweak elements of a pre-existing arrangement online or you can work in collaboration with the Aberdeen florists to create something completely unique. With the bespoke service, you can specify what flowers you would like, what flowers are to be avoided, what colours schemes are referred and whether you would like a bouquet or an arrangement. Once all the necessary details have been acquired, the florists in Aberdeen will turn your ideas into a beautifully crafted reality. Alternatively, if you’re unsure about what sort of flowers you would like to order, you are able to leave it up to the florist’s choice. All the Aberdeen florists have many years of experience in the floristry industry so they know a thing or two when it comes to your flower orders. All the florists need to know is what the occasion is and what sort of price range you’re working with and the rest will be taken care of for you. In addition to gorgeous floral designs, Aberdeen flowers also has a versatile gifts range on offer. As part of this gifts range, there are several items which are perfect for the new born baby girl as well as her parents. There are adorable and fluffy teddy bears on offer as well as helium balloons. The florists are able to arrange charming balloon bouquets for you which consist of three block coloured balloons and three with a fitting message for your occasion such as ‘Congratulations’ in this case. For the parents and other adult relations, there are chocolates as well as truffles on offer. These are perfect for anyone with a sweet tooth. Then there are fruit baskets on offer which are arranged on the day of the delivery to ensure all the fruits are fresh. There is also a selection of both champagnes and wines all rich in taste including the likes of red, white and rose wines. Both these drinks are widely considered to be celebratory which is why they’re simply perfect for an occasion such as the arrival of the new born baby girl. You are able to order these gifts as accompaniments to a bouquet of flowers or as gifts on their own. No matter what it is you’re after, Aberdeen flowers will always do everything within power to fulfil all of your floral requests. 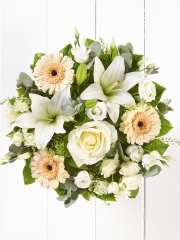 The joyous occasion of the safe arrival of a new baby is of colossal importance to all the family and friends of family which is why Aberdeen flowers have some lovely bouquets, arrangements and other gift items to mark the occasion. You are able to browse online through the different arrangements on offer to see if anything tickles your fancy. There are categories both for baby girl and baby boy flowers if you know the biological gender of the new born baby or you can order something in a neutral colour such as yellow or pastels. 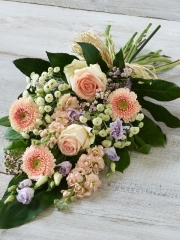 All of the floral designs you can see on the website are expertly arranged by the Aberdeen florists who hand pick only the best flowers, arrange them artistically amongst foliage and filler flowers and then wrap everything up in complementary papers, tissues and ribbons. Alternatively, if you have chosen a floral arrangement your flowers will be arranged in a container of sorts such as a vase, basket, box or even teacup depending on what sort of aesthetic you’re after. For the new born baby arrangements, the florists in Aberdeen use light, delicate flowers such as germinis, lilies and fragrant freesia to name a few. If you have seething more personal and specific in mind, then you are able to use the bespoke service which allows you to create a completely unique floral design. 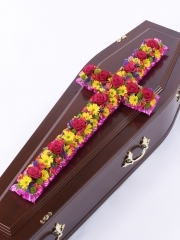 Flowers throughout history have always been used to mark out joyous occasions which is why the team at Aberdeen flowers take all your orders seriously. There is nothing the team want more other than to provide you with the most beautiful flowers as our number one priority is customer satisfaction which is why no matter what it is you’re after, Aberdeen flowers will do everything possible to fulfil all of your requests. In addition to gorgeous flowers, there are also some charming gifts on offer for both the new born baby and the parents. For the new born baby there is a selection of adorable teddy bears on offer of different colours, the perfect little comfort toy as well as balloons. 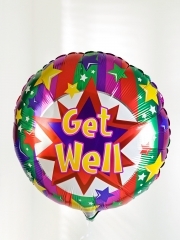 If requested, the Aberdeen florists are able to arrange charming balloon bouquets which typically feature three solid colour balloons and three with a message fitting for your occasion such as ‘Congratulations!’. For the parents of the new born baby, there are several different other gift options available such as chocolates and truffles, which are an ideal little gift for anyone with a sweet tooth. There are also fruit baskets on offer which are always filled to the brim with fresh, sumptuous fruits and are arranged by the Aberdeen florists on the day of dispatch. Additionally, there is a range of champagnes and wines including red, rose and white on offer. Both these drinks are widely associated with celebratory occasions making them simply perfect for the occasion of new born baby. 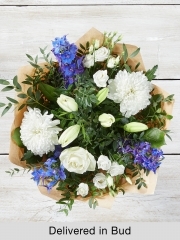 Aberdeen flowers hope that this gifts range can make your recipients feel that extra bit special and thought of as these gifts further personalise your flowers. You are able to attach a little card message to your flowers as well if you so wish it. No matter what it is you’re after, the Aberdeen flowers team will always do everything within power to fulfil all of your requests. If you have any further queries regarding any of the services provided, please do not hesitate to get in touch. You are able to get in touch either by phone or email as there is always someone readily available to answer any and all of your questions.